Art Therapy is a very young profession, yet for thousands of years art has been used to express emotional, cultural and spiritual needs. Art Therapy is a form of psychotherapy. It is not about learning art techniques or the production of aesthetically pleasing pictures, nor are special artistic skills or talents relevant to the process. Art Therapists are trained at Masters Level and are registered with a professional body: ANZACATA, the Australian, New Zealand and Asian Creative Arts Therapy Association. Art Therapy is suitable for all age groups and is practiced in a variety of mental health institutions, also in prisons, nursing homes and schools. It has proved a valuable therapeutic tool for those who have suffered emotional, physical, substance and sexual abuse. It is used in the context of family therapy, social work, counselling and personal development. Drawing, painting and sculpting can be a way to find answers to unresolved questions. They can provide nurturing, structure and inspiration in times of stress, burnout and disease. It can heal old wounds, transform emotional turbulence and show the way out of spiritual depression. Art Therapy, similar to music therapy and drama therapy, has the invaluable advantage of allowing expression without words. The name "initiatic" is derived from the term initiation, the awakening of inner perception. Initiatic Art Therapy uses a wide variety of art making approaches such as working with paint, crayons, collage, sculpting and clay and incorporates Somatic Experiencing, Jungian Depth Psychology, Transpersonal Psychology, Gestalt Therapy, meditation and bodywork. Both Guided Drawing and Work at the Clay Field are sensorimotor, body-focused, trauma-informed art therapy approaches. In recent years “sensorimotor” has emerged as a term to describe body focused psychotherapies that use a bottom-up approach. 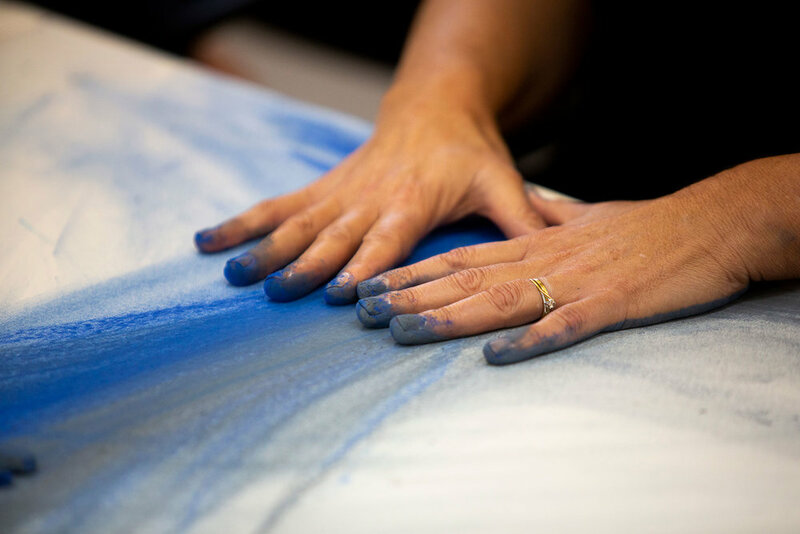 Instead of a cognitive top-down strategy, sensorimotor art therapy encourages the awareness of innate motor impulses in the muscles and viscera, also as heart-rate and breath. The expression of these motor impulses followed by their perception through the senses, allows the development of new neurological pathways that can bypass traumatic memories; such an approach is capable of restoring wholeness and wellbeing. Both Guided Drawing and Work at the Clay Field are sensorimotor, body-focused, trauma-informed art therapy approaches. They are not necessarily concerned with an image-making process, but support the awareness of body memories. While these memories are always biographical, the therapy itself is not symptom-oriented. Not the specific problem or crisis become the focal point, but the option to new answers and solutions as they are embedded in the body's felt sense. Guided Drawing is a body-focused drawing technique providing an archetypal structure that applies the philosophy of Jungian Depth Psychology to universal, formal elements such as a line or a circle or a square. Adults draw with closed eyes and both hands, using chalk crayons or finger paints on large sheets of paper. Drawing rhythmically with both hands does not use imagery, but the direct expression of one's Felt Sense. The process of exploring the history of these tensions, postures and attitudes leads to an unfolding of one's personal and trans-personal life story. A dialogue emerges between perception and expression, which creates increasing awareness of an inner guidance that knows the path towards transformation and healing. The 'clay field' is a large, flat box filled with smooth clay. With closed eyes one makes contact with the material and allows the hands to find their way through touching, scratching, digging, kneading, patting, beating ... until shapes start to emerge. Scenes become created, destroyed, recreated ... telling one's story. The haptic sense of touch is the most fundamental of human experiences. Infants rely on sensorimotor feedback to feel safe and loved; to be rocked, held and soothed is communicated through touch. Love, sexuality as well as violence are primarily communicated through touch. Our skin boundary becomes invaded through inappropriate touching, through accidents and medical procedures. The majority of traumatic memories involve touch. The regressive quality of clay in a therapeutic context will allow a therapist to address early attachment issues, developmental setbacks and traumatic events in a primarily non-verbal way. The focus is not on the story of what-happened, but on what-do-I-need-to-do-now to find an adequate response. Clay has the unique ability to feedback every imprint we make. As I touch the clay, I am touched by it. In this way the encounter at the clay field allows us to gradually rewrite our biography, to respond in a new way, to find a fuller more connected flow of our life force. Emerging research shows that Clay Field Therapy is deeply therapeutic particularly for traumatised children – and adults. Watch the video for a great case study showing work at the Clay Field.